Even in a tough economic climate, the startup business community has found a way to create innovative, game-changing products in shockingly short timeframes. So why should larger, more established companies take notice? Because they have everything to gain when they examine and adopt the strategies, tools, and attitudes of these smaller competitors. 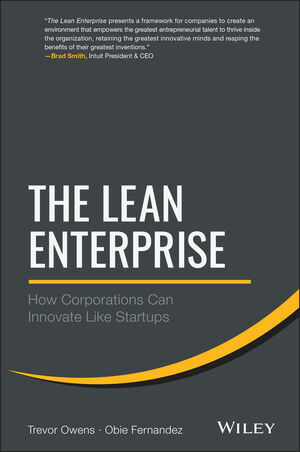 The Lean Enterprise presents a groundbreaking design for revolutionizing larger organizations, one that draws on the ingenious tenets and practices espoused by the startup community. The guidelines in this book will help companies shake the lethargy, bureaucracy, and power struggles that plague large organizations and hold them back from true innovation. At the heart of this resource is a comprehensive, practical approach based on methods, timetables, compensation, financial investment, and case studies that reveal the startup mentality. Respected thought leaders in lean startup methodologies, the authors cover successful enterprise development, development innovation labs, corporate venture arms, and acquisition and integration of startups. Don't be mystified by the success of startups. Master the methods of this new generation of entrepreneurs and compete on a level playing field. TREVOR OWENS is an entrepreneur and thought leader in Lean Startup methodologies. He is the Founder and CEO of Javelin.com, an innovation training and software company known for its Lean Startup Machine workshop that has helped tens of thousands of innovators, including those from Google, Salesforce, News Corp, Intuit, and others, start thousands of new businesses across six continents. OBIE FERNANDEZ is an avid writer and technology enthusiast. He works with Owens as the Co-Founder and CTO of Javelin.com. Fernandez is also author of the best selling technology book The Rails Way and the founder of multiple successful companies, including one of the world’s best known Ruby on Rails web design and development agencies, Hashrocket.